"...A fairly accurate comparison for The Last Supper is 'Game of Thrones'." "An unforgettable epic re-creation of the birth of the Han dynasty, terrifying and lyrical." 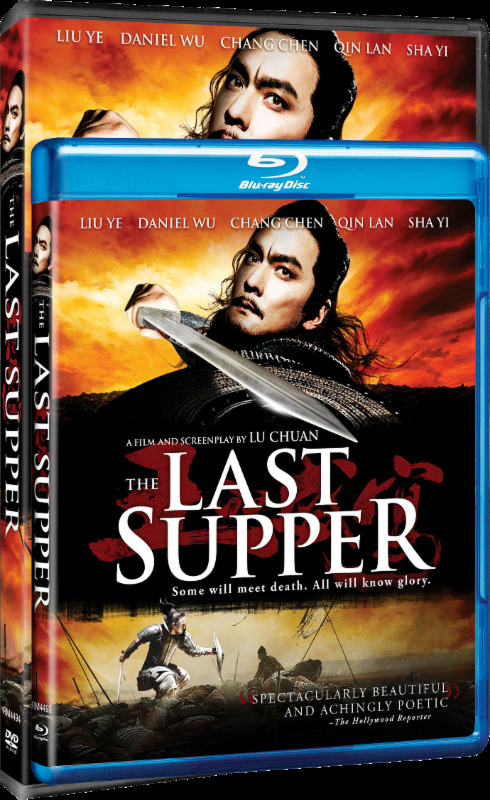 Los Angeles, CA - "Compelling in its detailed intrigues and magnificent frescoes," (Variety) the heroic Chinese-language historical drama, The Last Supper, arrives on Blu-ray (SRP $19.93), DVD (SRP $14.93) and Digital HD October 14 from Random Media and Cinedigm. Featuring lavish action sets and extravagant style, the visually stunning retelling of the Han dynasty is directed by internationally acclaimed filmmaker Lu Chuan (City of Life and Death) and features China's two-time Asian Film Awards nominee Ye Liu (City of Life and Death), Daniel Wu (Protégé, The Banquet, Legend of the Black Scorpion) and Chen Chang (Crouching Tiger, Hidden Dragon). Witness a young peasant's meteoric rise to power in this action-packed martial arts saga from renowned director Lu Chuan. During the tumultuous last days of the Qin dynasty, the Commander of the era's most powerful army recognizes great potential in an inexperienced laborer named Liu. When he gives Liu command of thousands of officers, he unwittingly sets in motion a chain of events that will put his own life in peril and determine the fate of a nation. Praised by audiences and critics alike, The Last Supper chronicles the brutality of war and the devastation of betrayal. The Last Supper follows Liu Bang (Ye), the first emperor of China's Han Dynasty, as he recounts his life on his deathbed through restless memories and flashbacks. Haunted by nightmares of his biggest enemies, Lord Yu (Wu) and General Xin (Chen), Bang recalls his betrayal of both men due to his overwhelming thirst for power as an uncultured and uneducated soldier, which led to paranoia and fear once he became ruler. Even years after the deaths of Yu and Xin, Bang's soul is still deeply troubled as he is unable to find peace in the position he dreamed of and fought ruthlessly to achieve.